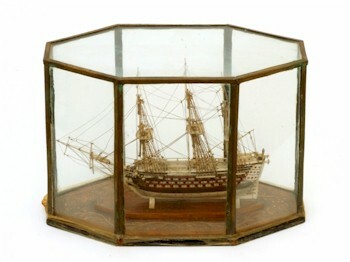 The pinnacle for collectors of ship models is those from the Napoleonic period made by French Prisoners of war around 1775-1825. Finely detailed and good scale Prisoner of War models have held a strong position in the market from many years, showing no sign of decline in values. A fine early 19th century boxwood and ivory model of the third rate 74-gun HMS Mars, sold at for £60,000. Smaller uncased examples in good condition start from around £2,000-£3,000, with cased models fetching £6,000-£8,000. Larger Prisoner of War models of noted ships regularly achieve upwards of £25,000-£30,000 at auction. A staggering price, but one well justified when one sees the quality and detail of the fine carving of these models. A fine French Prisoner of War ivory model of a 90 gun ship of the line sold for £5,800 in a Bearnes Hampton & Littlewood maritime auction. Royal Naval models and dockyard models are also constructed to a very high degree of detail and therefore command similar prices at auction to the Prisoner of war models. Once again 17th and 18th century examples are the most desirable for collectors. Boardroom models of merchant and Royal Naval vessels are other examples of excellent ship model production during the first half of the 20th century. Many companies relied on commercial shipping for their trade and so detailed scale models of the vessels in their fleet were commissioned for the company boardroom. 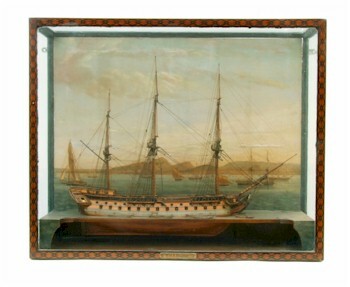 These models are generally much larger in scale to the early 19th century ship models, and are often mounted in heavy glazed cases. Prices again reflect the quality of workman ship in these boardroom models with the upper end of the market fetching between £20,000-£30,000. For many, the simplest ship models and perhaps those most memorable are the scale model pond yachts regularly found at auction. Many town parks still not only retain their original bandstands, but also their original sailing ponds. From solid wood hulled examples through to full scale ribbed hull pond yachts, their appeal for those who remember sailing them as a child remains. Collectors are particular keen in acquiring a scale built racing yacht hull, and are willing to pay upwards of £400 for a good example. For the modest collector a simple Tri-ang tinplate or wooden hulled pond yacht is perhaps obtainable at a £40-£60 estimate.